Laid Off Loser: Laid Off Loser Album of the Day: "You Can Have What You Want"
Laid Off Loser Album of the Day: "You Can Have What You Want"
Awash in reverb-drenched organ, Papercuts' third album replaces the rootsy lilt of 2007's Can't Go Back with a mellow psychedelic sheen. 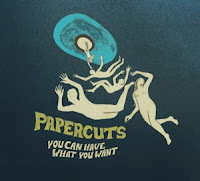 The sounds cooked up here by Jason Quever, the one-man band behind Papercuts, defy easy categorization. You Can Have What You Want is close to drone rock, but it's too infused with melody. It's close to folk, but it's too rooted in pop. It's close to blues, but it's too blissed out in shoegaze swirl. It's all of those things and none of them, and in the end, it matters little what you (try to) call it. Above all, this record is about mood, and whether that means "staring at the sky on a sunny spring day" or "staring sulkily at a cubicle wall," escape into your earbuds and lose yourself in the music.